With its magical light, brooding Atlantic seascapes, and harmonious co-existence of traditional and high-design architecture, Fogo Island is a photographer’s playground. 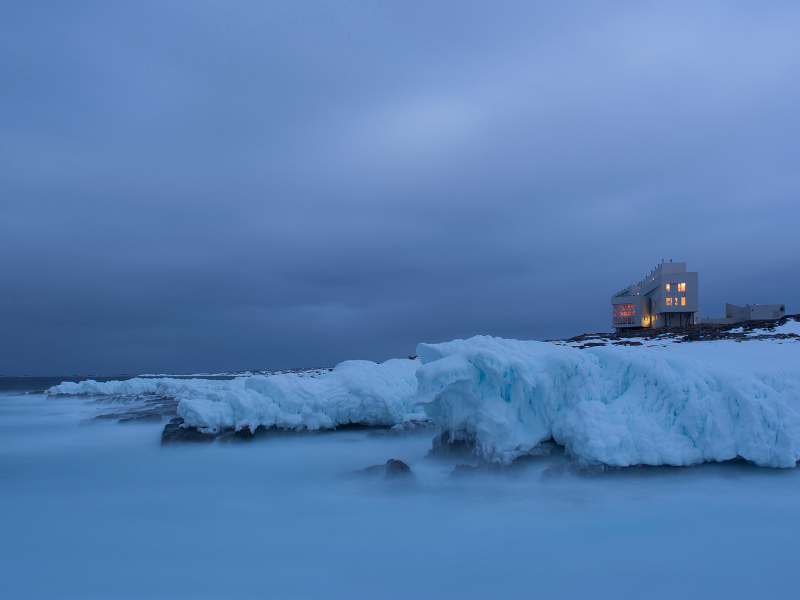 Adventurous travellers with a passion for capturing dramatic images can stay at Fogo Island Inn for five days in March or June and take their photographic skills to the next level. New York-based photographer and instructor, Alex Fradkin, provides three full days and four evenings of photography workshops and tutelage. Join the Expedition in either the Ice Season (March 26–30, 2015) or during the Trap Berth Season (June 3–7, 2015). Fogo Island, at once immense and intimate, is a place with seven distinct seasons. The Ice Season is a time when the Arctic pack ice arrives with the Labrador Current to gorge the bays—a spellbinding spectacle of sculptural undulating raw ice. Aqua-tinged, the ice forms rifters and ridges, sometimes packed together by the wind; sometimes drifting apart to reveal inky blue ocean. And with the ice, come the seals. Caribou herds wander the stark and snowy landscapes—hours spent tracking them present brilliant photography opportunities in March. Indoors, wood-burning stoves and hand-stitched quilts create intimate nests—perfect for atmospheric shots. June’s Trap Berth Season, is peak iceberg time and a time to welcome returning migratory birds who follow the capelin to our shores: terns, razorbills, kittiwakes, gannets and puffins. The season’s name refers to the historic markers used for cod trap fishing berths. When the cod was plentiful they were dropped on June 1st at 12 P.M. each year. In June wild flowers bloom along the shoreline, and local fishers take to the choppy ocean in traditional wooden punts they built themselves. Guests at the Inn enjoy such activities as hiking and biking; visiting root cellars and smokehouses; whale watching and bonfire nights. Nature photography will be a primary focus of the Photography Expedition during Trap Berth Season. A professional photographer and instructor at the world-famous International Center for Photography in Manhattan, workshop leader Alex Fradkin will help participants create captivating images worthy of a travel magazine. Working on the elements of light, composition, form and textures, Alex will lead field trips to stunning insider spots, such as secluded Oliver’s Cove; the Todd Saunders-designed artists’ studios; and the Irish community of Tilting, with its well-preserved fishing stages and wooden homes. As well as collectively reviewing work at the end of the day, the photography group will share in an evening around a bonfire for a traditional fish boil-up. Then they’ll go to chat and enjoy a drink—maybe even sing—with locals in the informal setting of Phil’s shed. The Photography Expedition to One of the Four Corners of the Earth starts at $6,700 (CDN)—exclusive of taxes—per person, double occupancy. Solo travellers will pay a supplement of $900 (CDN). This includes five days and four nights at the spectacular Fogo Island Inn, with all meals included (daybreak, breakfast, lunch, supper); private flights from St. John’s to Fogo, and back to Gander International Airport for homeward commercial flights; all land transportation on the island; daily photography tuition by Alex Fradkin; outdoor photography field trips focusing on the unique architecture, landscape and culture of Fogo Island; and evening workshop activities. There will be a maximum of 12 photography lovers in the group—all levels are welcome. Alex first came to Fogo Island in Spring of 2013, on assignment for Monocle, and has since returned seven times over multiple seasons, creating images for the Fogo Island Inn and providing photographs for more than sixty publications, including: National Geographic, Condé Nast Traveler, Travel + Leisure, Newsweek, Time, New York Times Magazine, and Outside. In 2015, Alex will be publishing a book on Fogo Island through a major New York publisher. Fogo Island Inn sits on an Island, off an Island, off one of the four corners of the Earth. It is a founding member of the National Geographic Unique Lodges of the World. The Inn was chosen to be among a collection of 24 unique hotels in extraordinary places around the world with a demonstrated commitment to sustainability, authenticity and excellence. It was also recently noted as the 2015 Hideaway of the Year by Andrew Harper. Each of its 29 one-of-a-kind guest suites has dramatic floor-to-ceiling windows that open onto the wildest and most powerful ocean on the planet. Most suites have a wood-burning fireplace stove; all are furnished with quiet luxuries. Photographers will board a private charter from St. John’s, Newfoundland at noon, on the first day of the winter and spring packages, for a 30-minute flight—with breathtaking aerial views—to the Fogo Island airstrip. Those coming from the United States may prefer to arrive into St. John’s the evening before. For reservations or to speak with an adventure specialist call or email us today!